The Worcester County Motorcyclists’ Survivors Fund is a 501c3 non-profit organization of all volunteers who raise funds to help Worcester County families of riders killed or seriously injured in a motorcycle accident. 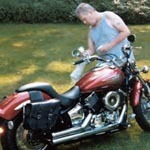 We also promote motorcycle safety and awareness to help reduce accidents, injuries, and fatalities. Please visit our Application page for more information. 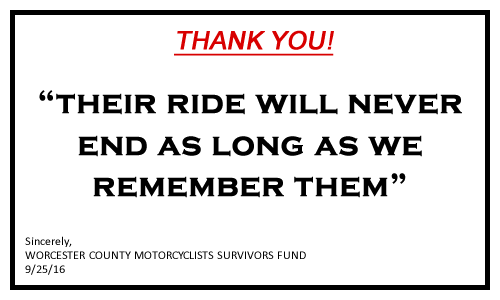 Your donations, purchases of Survivors Fund products, and attendance at Survivors Fund Events go to help families of riders who have lost household income due to a motorcycle accident. Mark September 22, 2019 on your calendars for the 11th Annual Chic's Ride! Planning is underway and we will again be at the American Legion Chester P Tuttle Post #279 in Auburn. Your support continues to make a difference! The Worcester County Motorcyclists' Survivors Fund is a 501(c)(3), fully non-profit organization and with your support we have assisted 3 families in the past 9 months totaling more than $11,000. We have helped by way of paying mortgages, utility bills, food and assisting with funeral expenses. We would not be able to help without the support of every one of you. Your contributions, by attending our events, purchasing our products or simply dropping a small donation into our jar makes all of this possible and we extend our deepest gratitude. Thank YOU for making a difference! 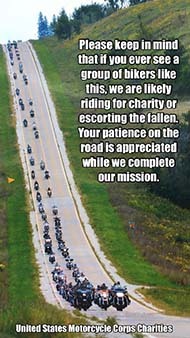 © Copyright 2010-2018 Worcester County Motorcyclists’ Survivors Fund. All rights reserved.